I was so thrilled with this month’s Love with Food box that I went straight to Target and bought some of the GoGo Squeeze apple sauce on the go packets (I think I bought a box of every flavor). It’s definitely one of my favorite products now- it’s so yummy, if you haven’t tried it then you totally should! 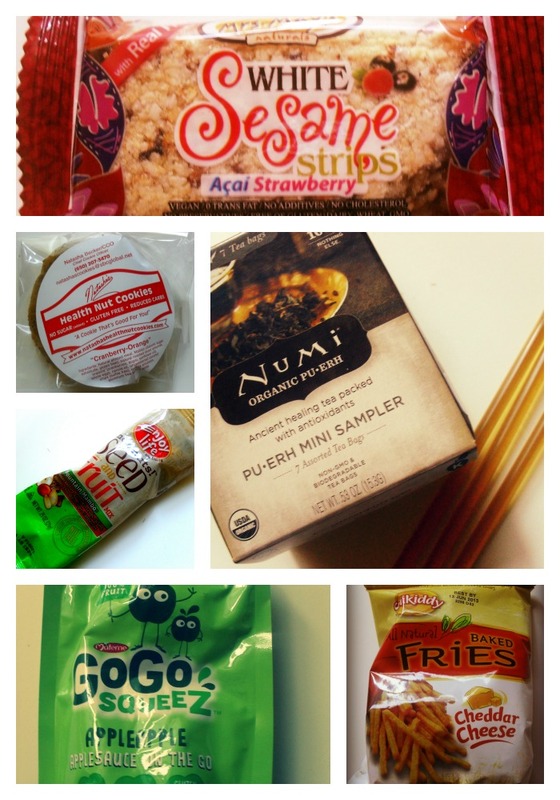 Anyways here are the other products that were featured in the box: Mrs. May’s Natural Superfruit Acai Strawberry Sesame Strips, a Health Nut Gluten-Free Cookie, Numi Organic PU-ERH mini sampler, Seed and Fruit Trail Mix from Enjoy Life, Honey Straws by Nature’s Kick, and Baked Cheddar Cheese Fries from Snikiddy Snacks. I really loved the tea and the honey straw; they had a great taste and would be perfect in a gift basket! After receiving the box and trying my tea and honey, I went to the Love with Food online store and bought a pack of the orange blossom ones – and if that’s not a glowing recommendation then I don’t know what is! The Strawberry Sesame Strips had a great blend of sesame and strawberry flavors, and a good sweet crunch. Love it. The Health Nut Gluten-Free cookie was surprisingly good; you couldn’t even tell that it was gluten free or anything! I also bought three boxes of these- one in every flavor. I loved the Seed and Fruit Trail Mix, and couldn’t get enough of the Baked Cheddar Cheese Fries – I know they sell them locally so I can’t wait to get my hand on them! Overall, this box was stellar, and I’m so glad that I stuck with my subscription. In fact I loved the box so much that I just purchased a 6 month subscription! Love with Food is a great subscription service, and I feel that you definitely get more than your money’s worth. Click here to sign up! It would be great if you used my affiliate link (here), which helps support this blog and keeps it running! Previous Post Michael Angelo’s and a sweepstakes not to be missed! Next Post Oz The Great and Powerful : March 8th!